This country style home is set on just under one acre which is centrally located to local attractions and events. Guests can access their own lounge area which opens out onto the covered alfresco and large backyard area with a country outlook. Hillview is a ground level studio. 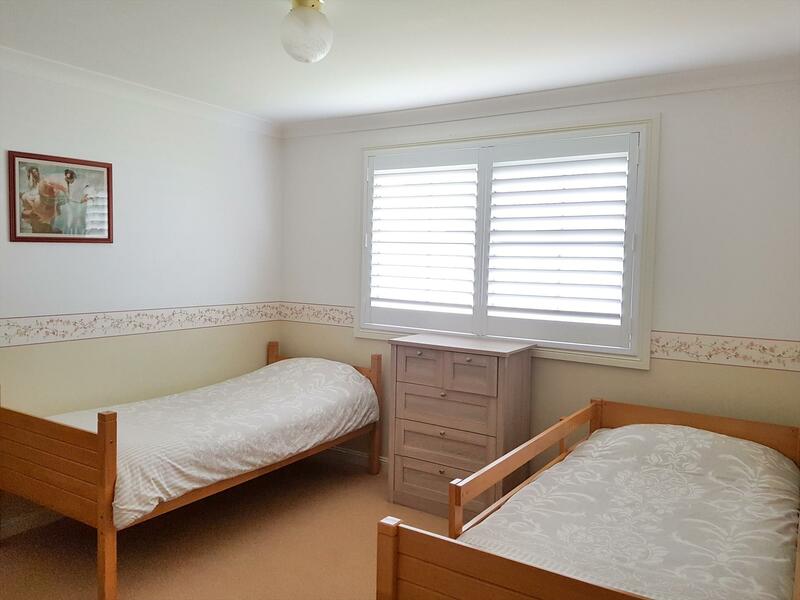 The accommodation has a separate entrance and can be booked as a studio with a queen bed or with an additional bedroom containing 2 single beds. A rollaway is available for an extra child for an additional fee. The accommodation consists of a bathroom, and lounge area and the living area that opens onto a large under covered entertainment area. Tea/coffee making facilities and refrigerator are included. 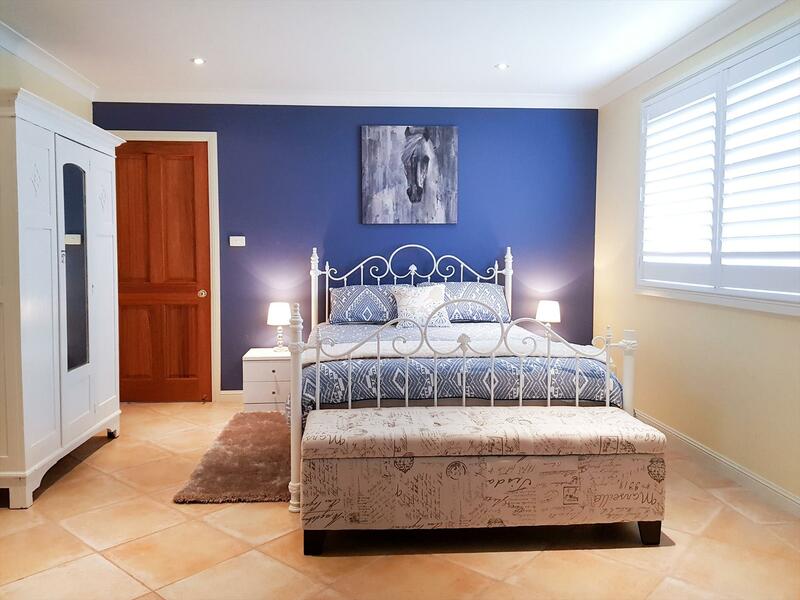 An ideal location for a family or small group getaway just over 1 hour south of Sydney. The owner occupies part of the house and is separate to the accommodation. Small pets by arrangement additional fees apply payable directly to the owner. Hillview is located only 5 minute drive to "Jamberoo Action Park" NSW's favourite water theme park, Croome Road Sporting Complex, "Ravensthorpe" wedding venue, Albion Park Regional Airport and HARS-Aviation Museum which is home to the Qantas Boeing 747. A short 10 minute drive to Minnamurra Rainforest and Jamberoo Village, close to the Macquarie National Park with bushwalking, Shellharbour Village Cafes, restaurants and local beaches. Learn to surf at Killalea State Park "The Farm". The property is also central to several local golf courses. Visit the Kiama blowhole, stunning beaches, cafes and restaurants. Travel 20 minutes north to beautiful Wollongong or south to Gerringong and beyond to gorgeous Berry. A little further south you will find the Shoalhaven Zoo and Shoalhaven Tree Top Adventures. An easy day trip to the Southern Highlands or South Coast Wineries. One queen studio room with a queen bed with private lounge area, opening out onto covered alfresco area. Private entrance, tea/coffee, bar fridge, TV, free wireless internet, air-conditioning, ceiling fans, linen provided. (Rollaway available for extra child for an additional fee on request). Pet on request for an additional fee payable directly to the operator. One queen studio room with a queen bed, additional bedroom with 2 single beds. Private lounge area, opening out onto covered alfresco area. Private entrance, tea/coffee, bar fridge, TV, wireless internet, air-conditioning, ceiling fans, linen provided. (Rollaway available for extra child only for an additional fee of $25 per night on request). Pet on request for an additional fee payable directly to the operator. For stays up to 7 days if no show or if cancelled within 48 hours from date of arrival 1 nights accommodation will be charged. No refunds for early checkouts. For stays of 8 days or more in duration if cancelled within 28 days from date of arrival a cancellation fee of 20% of the total booking cost will be charged. - No noisy house-guests neighbourly consideration please. - Please acknowledge and be considerate of noise as pets live on the property 2 horses 1 dog. - Pets by arrangement only additional fee applies (For safety purposes owner has dog and horses on property it is the guests responsibility to ensure the pet doesnt get in with the horses the fence is 1.2m high).